Vehicle history expert CARTELL.IE reports today (July 17) that new vehicle sales so far this year are set to eclipse last year’s total – with more than 5 months of the year remaining. 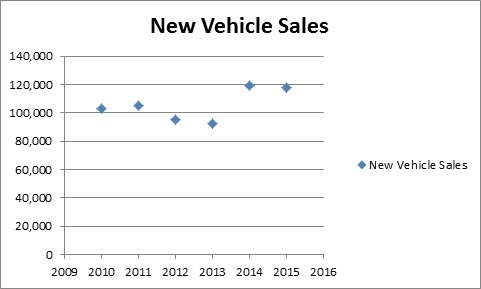 There have been 118,083 New Vehicle Sales (all types) in the year to date. Last year’s total was 119,172. The month of July has already recorded 17,310 new vehicle sales with half the month remaining – already well ahead of the totals recorded for April (13,053), May (9,514) and June (2,636). Also today Cartell.ie report the colour white is the most popular colour for new vehicle purchases in 2015 (all vehicle types). In a further sign of an improved economic environment the colour white, with recorded sales of 21,871, is ahead of black (21,385) and silver (20,950). The popularity of white may be a further sign of increased economic activity in the commercial sector as white is traditionally a popular colour for company and commercial vehicles.